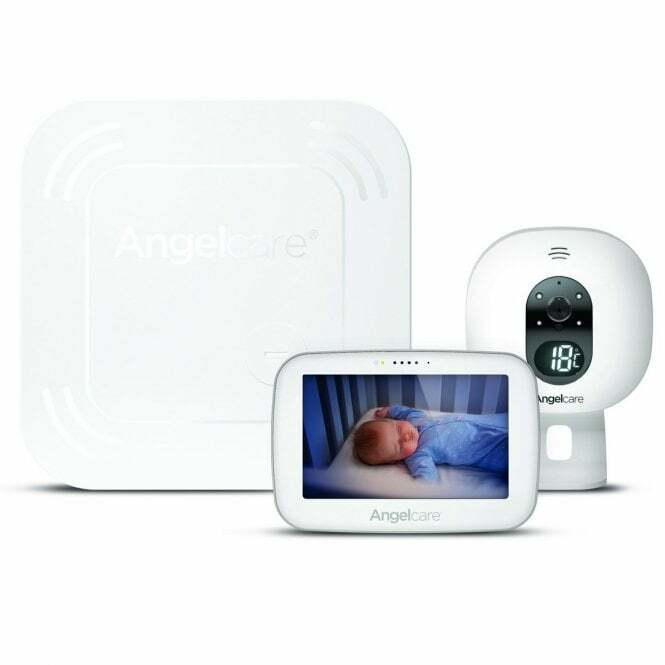 Angelcare AC417 Baby Movement Monitor With Video is an award-winning baby monitor. Featuring advanced analytics and a sophisticated design, this monitor gives parents the ultimate peace of mind. Why should I buy the Angelcare AC417 Baby Movement Monitor With Video? The Angelcare AC417 Baby Movement Monitor With Video allows you to relax whilst baby is drifting off to dreamland. It features advanced analytics and data reports which cover two months of conditions of bubba's nursery. This therefore allows you to adjust conditions in the room to improve your little one's sleep. As well as this, the Angelcare AC417 Baby Movement Monitor With Video features digital audio as well as secure video. Plus, it provides you with room temperature reports so you can track and adjust to your peanuts needs. Simply place the Angelcare Movement Sensor Pad underneath your little ones mattress and allow it to sense the tiniest of movements whilst baby sleeps. Plus, it alarms if there has been no movement for more than 20 seconds. The data from this sensor pad is then stored onto your parent unit which allows you to track and trace. What's more, the camera on this baby monitor features a wide angled lens. Plus a colour-coded digital temperature display and two way audio! If you want to chill out in the lounge whilst baby gets some well needed sleep, fear not. You can monitor bubba and their nursery in real time as well as check on the room temperature. The Angelcare AC417's Movement Sensor Pad can be used with most baby mattresses. However, it cannot be used with memory foam mattresses or mattresses with a hollow frame. What are the specifications of the Angelcare AC417 Baby Movement Monitor With Video? Do I receive a warranty with the Angelcare AC417 Baby Movement Monitor With Video? Yes, Angelcare offer a 12 month Manufacturers Warranty from the initial date of purchase (not when it was first used). This applies to UK Mainland only.